As war loomed in 1939, German bombing appeared inevitable, and evacuation became an absolute priority. However, it wasn't only people who were evacuated from the cities. Paintings and art treasures were also among those evacuated, firstly to caves and castles, and then to a cavern complex in Merionethshire, mid Wales. The National Gallery had evacuated its treasures once before in 1938, when the Sudetenland Crisis threatened to plunge Europe into war. Conflict was avoided in that situation owing to a controversial diplomatic pact between Germany, France and the United Kingdom known as the Munich Agreement. In August 1939, however, things were different. With a clear clash between Britain and Germany developing in Europe, the National Gallery closed its doors on 24th August 1939 and began crating up the artwork that had hung in its marble halls. The paintings were transported in unmarked transports, sometimes even butcher's and baker's vans to their new storage sites in Wales. A far cry from the marble halls and public attention they once enjoyed, the paintings would be stored in secret for the foreseeable future. The new home of some of these paintings, if only temporarily, would be a small cave just outside Aberystwyth, Cardiganshire. Others were sent to caves in Bangor, Anglesey and yet others still to the vaults of Welsh castles such as Caernarvon. Some were stored in spare rooms in country houses, as pictured here. 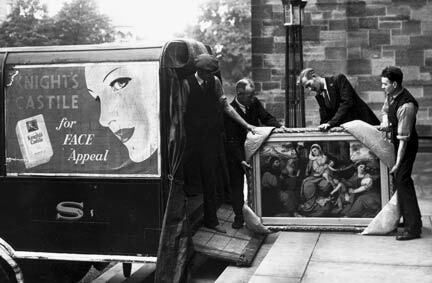 In 1940, with the renewed threat of German invasion, plans were discussed for evacuating the paintings out of the UK all together, possibly to Canada for the duration of the war. This was vetoed almost immediately by Winston Churchill, the Prime Minister, who refused to allow these paintings to be sent abroad as it would be seen, if discovered, as a lack of confidence in the defences the UK had to call on. He did, however, consent to the paintings being reunited in a cave system in Merionethshire, just outside Blaenau Ffestiniog, as long as they were properly protected. Their transfer having been completed in 1941, the paintings would remain stored in brick bungalows constructed inside the caves until the end of the war. 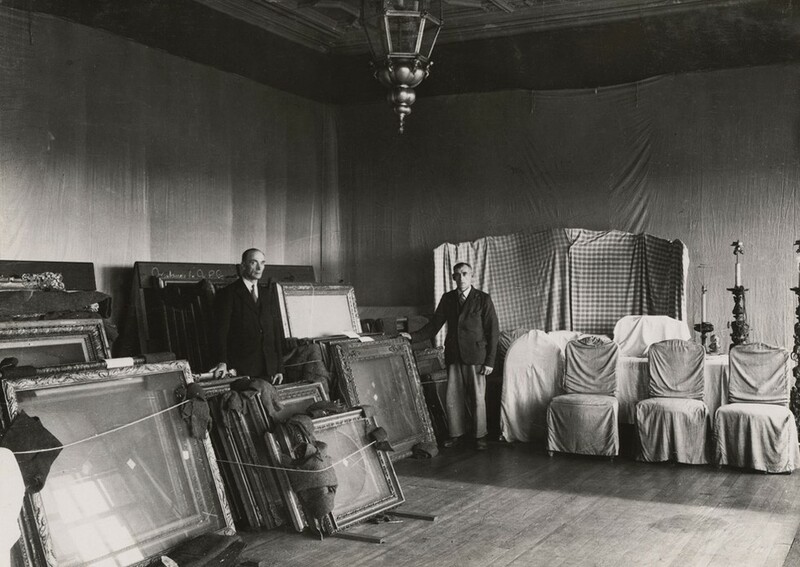 Their storage proved a constant challenge for the National Gallery, as a damp, cold cave is far from the dry conditions a painting requires for optimum storage. However, the uniform drabness of the caves allowed the Gallery to perfect techniques for storage of paintings, techniques they still use today for the storage of art. To discover more about Britain in 1939, explore our newspaper collection.